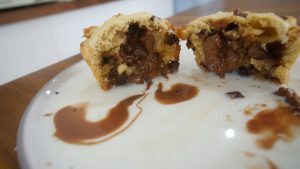 This was such a fun recipe to make – chocolate lava cookies! 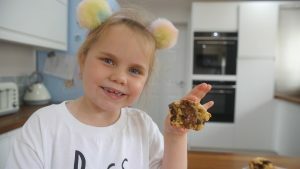 Chloe takes the lead here and what you are left with is an amazing combination of cookies and muffins with a yummy chocolate truffle melted centre! Best served warm in milk to let the chocolate ooze out! First up add the butter, oil and sugar into a mixing bowl and cream together using your spatula or you can use a stand mixer or electric mixer – do this until smooth and creamy. Add in the egg and again mix well. Follow up with the dry ingredients – the plain flour, cornflour and chocolate chips and mix well, so that it thickens, if it’s too runny add a few more tablespoons of flour but the next step will help to firm it. Get some clingfilm and push the cookie batter onto it. Wrap it up and place in the fridge to firm up – roughly 45 minutes to an hour. Once firmed take a muffin tin and grease lightly, take small pieces of the dough and press into the tin to form cookie cups leaving a gap in the centre. Do this to 6 times to create 6 cookie cups. Fill each one with a truffle and use remaining dough to make a lid pressing into the sides of the dough to seal in place. Bake in a pre-heated oven at 170c or equivalent (see temperature conversion chart) for around 18 minutes or until browned at the edges – the tops won’t brown. Leave to cool in the tin for 5 minutes then lift out onto a wire rack. Best served still warm with a little bowl of milk dunked in! Amazingly gorgeous – give them a go!